Check out our list of most Frequently Asked Questions about the Regatta, answered here to help make your time at the event carefree and enjoyable. Can’t find the answer you’re looking for…visit and LIKE our facebook page at https://www.facebook.com/RR and post your question there . . . we’re always looking to update the list with useful tips and info! A: Absolutely not. It’s all FREE. There is no admission fee and no charge for any of our events or acts. Q: WHAT TIME DOES THE GREEN BRIDGE CLOSE? A: The scheduled closure of the Green Bridge is from 4 a.m., Saturday, Feb. 9 to 1 a.m. Sunday, Feb. 10. Q: WHAT ARE THE RIVER RESTRICTIONS FOR REGATTA? 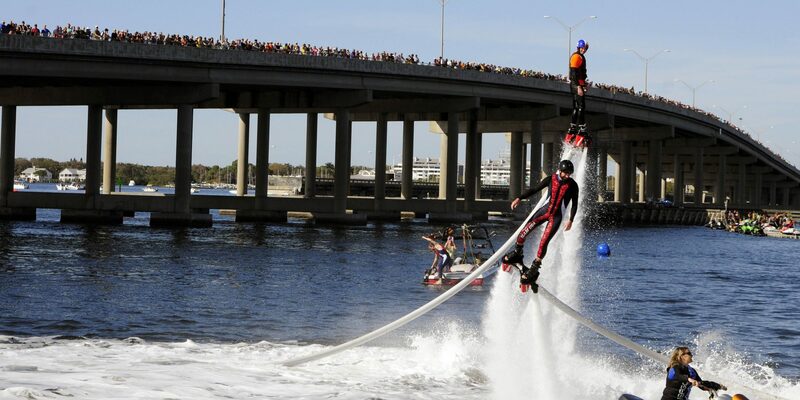 A: The U.S. Coast Guard mandates all river restrictions for the Bradenton Area River Regatta. For the safety of performers and spectators alike, boaters must adhere to the “Spectator Anchoring Area” no-cross perimeter defined by red buoys in effect during all racing and water activity on the Manatee River. Law enforcement will be patrolling the river at all times to ensure compliance with these restrictions. Q: WHAT ARE THE RIVER RESTRICTIONS DURING FIREWORKS? A: A spectator/boating safety zone will be in effect during the Regatta’s fireworks show. Again, boaters must adhere to the “Spectator Anchoring Area” no-cross perimeter defined by red buoys in effect during the show. Law enforcement will be patrolling the river at all times to ensure compliance with these restrictions. Q: CAN I WATCH THE FIREWORKS FROM THE GREEN BRIDGE? A: Yes, the closure of the Green Bridge applies to vehicle traffic only. Spectators are permitted and encouraged to use the bridge as a viewing area for all water activites and, this year, are allowed to stay on the bridge to watch the fireworks display. A: Yes, but there are rules to observe if you do. Dogs and other permitted pets must remain leashed at all times while enjoying the festival. A: Yes, coolers are allowed, but are subject to “checks” at the discretion of law enforcement. Q: CAN I BRING MY OWN ALCOHOL/BEER? A: No. Alcoholic beverages are not allowed within the event footprint. An approved “beer garden” has been permitted for the event. Spectators can purchase beer here and must consume it within the garden. A: You can…but we’ve gone to great lengths to bring you the best foods of the area, featuring the cuisine of top local restaurants in the County…all reasonably priced and loaded with lots of delicious variety. And, concession areas are located on both sides of the Green Bridge to make it easy and convenient to grab a bite and never miss a beat of the action. Q: HOW MANY DIFFERENT VENUES MAKE UP THE REGATTA? Bradenton Riverwalk—primary spectator area for great views of all water activities and fireworks. It also features one of the two concert “Main Stages” for the event. Green Bridge—perhaps the best place for watching races and all water activities. Palmetto Pier and Riverside Drive—primary spectator area for great views of water activities and fireworks. It also features one of the two concert “Main Stages” for the event. Q: WHAT DO YOU HAVE FOR KIDS TO DO? A: Regatta has an outstanding “Kids Zones” in two places: along the Riverwalk in the “Great Lawn” in front of the Day Dock [marked by light poles 2 to 5] and in Palmetto on the Palmetto Pier. Q: CAN I BRING MY OWN LAWN CHAIR OR BLANKET TO THE EVENTS? A: Yes, we encourage it. Q: IS THERE ANY SEATING FOR THE EVENTS? A: Due to the volume of spectators, Regatta does not provide individual seating areas. Q: IS THE AREA HANDICAP ACCESSIBLE? A: Yes, viewing areas are handicap accessible. Q: WHERE ARE THE RESTROOMS LOCATED? Q: BESIDES THE WEBSITE, WHERE ELSE CAN I FIND MORE INFORMATION ABOUT THIS YEAR’S EVENTS AND ACTS? A: Become a fan of the Bradenton Area River Regatta on Facebook by clicking HERE and learn more about this year’s events and acts…and to participate in this year’s contests. Q: WHAT ARE THE HOURS OF THIS YEAR’S EVENT? A: Please check the schedule listed here on our website for the most up-to-date times and locations of all acts and activities.